Can I say how excited I am about these Ann Taylor knit pants? I generally avoid leggings (besides my denim leggings) because of my wide hips and short legs, but these are a thicker, nicer knit with pockets (there's a cool side zipper pocket that's not visible in the pictures). They're comfy, fitted, and stylish (sings praises for the petite sizing) - what more could I need? Oh yes, other colors - I need them in more colors. such a xmas atmostphere! love your glitter shoes..it makes you look more fashionable. and it is trendy!! have a nice xmas! Those pants are awesome on you! I need to look into those, love this outfit! Love the color-blocking going on with your shirt! Very cute. Cute outfit pants and shirt are beautiful but I am falling for your necklace and your bunny.... he (or she) is adorable. I am loving your pictures. Great top, colorblocking all in one! Thanks for the blog love babe, hope to see you back soon! 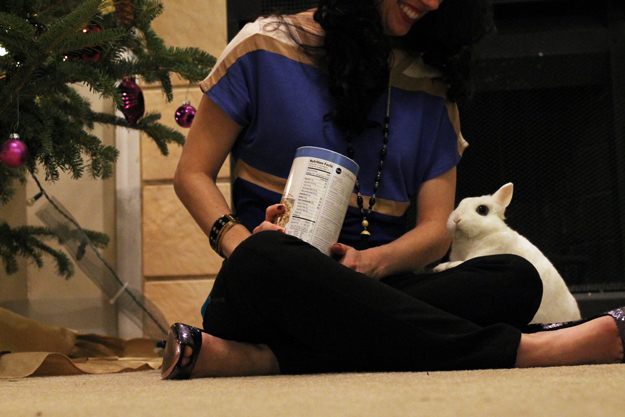 I love your top and pants, your outfit is so chic and pretty :) And your bunny is so cute! now following. I love the pants, but I am even more in love with the top. It's gorgeous! Also, the bunny is SO cute. I just want to squeeze it! I love the top! and that bunny is too cute! Love it! 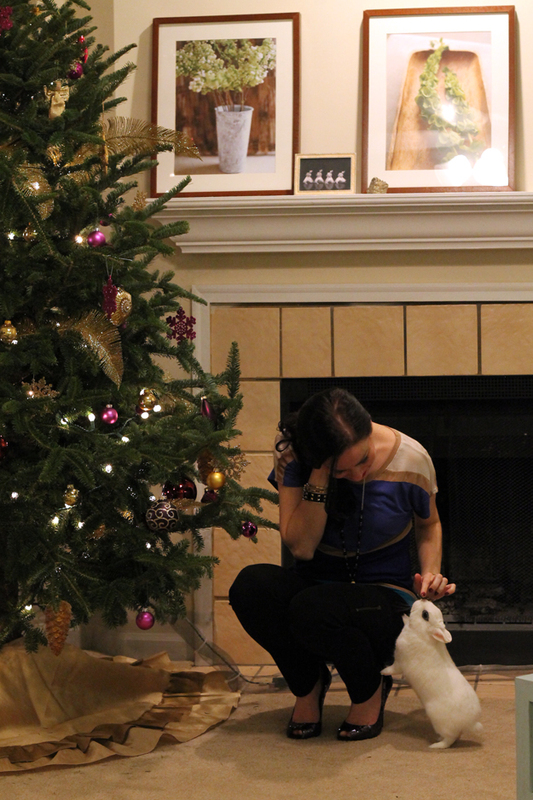 :) and the bunny soooo sweet, does he fallow you all the time like a cat? You look gorg as usual..
what a lovely holiday outfit! You look so cute!The pants are great! I am SO in love with your bunny; I love animals and this little guy is adorable. I think the blog name is really clever too.